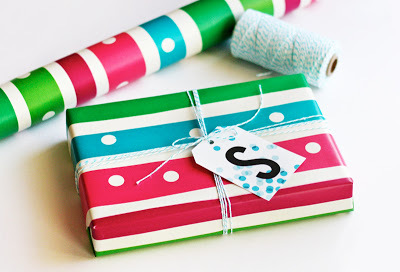 I love the idea behind these simple and festive monogram gift tags. At first I figured they wouldn't work for us, because we have two O's in our family, but they solved that issue by making four different colored sets. Instead of trying to coordinate the gift tags to the gifts, I can just coordinate a color to a kid! Perfect! You can download the four sets of printable monogram gift tags over at How About Orange.